Provides race information, results, and race reports. Located in Lynchburg. The largest 1-day mountain bike race in the United States, it is a 27 mile point-to-point race in Northern Michigan. Includes race information, registration and results. Annual race held in Michigan since 1969. Race results, photos, sponsorship and competition information. A mountain bike adventure race through the Canadian Rocky Mountains, includes race maps, race information, stage results and rider profiles. Located in Suches, GA, this thirty hour race will take place January 17-19, 2003. Site includes race information, a teammate finder, and online registration. Official site for the worlds foremost sled race, the Iditarod Great Sled Race, with regular updates during the race, musher biographies, and educational links. New Zealands elite adventure race with a worldwide audience. This is a 5 day expedition style, multi-discipline race. Triathlon and Duathlon race production services. Race directing, set-up, and computerized timing and results. Site also contains race information, results, coaching and nutrition advice. Includes photos and information about the history, background, and events surrounding the race, Il Palio. Also provides current year race entries and dates. Annual expedition race held during February in the most southern tip of South America . Race results, rules, entry details, and equipment lists. Based in Little Rock, Arkansas. Listing of team members, gear, race reviews, pictures, regional race listings and race calendar. The sculptures race at events throughout the USA. Judged for art, engineering, pageantry and speed, these vehicles race on mud, pavement, sand, and water. Information for visitors of the Grand Prix Circuit, Twelve Hours of Sebring race event. Details history, overview of the race, news, local hospitality and accommodation links, travel directions and an online store. Midwest adventure race series. Site provides race format and information, FAQs on adventure racing, and online registration. Directory featuring Arabian race horse breeders, racing Arabians, free photo classifieds, Arabian race horses at stud and for sale, and racing links. International Federation of Sleddog Sports (IFSS) World Cup Stage Race, sponsored by the Russian Federation sports committee and the local Kamchatka Government. Includes race information and history. General information, race schedules, and race registration. Providing race reports, photographs and race schedules. Race promoter located in the Southeastern United States. News about the amateur ski race in Colorado. Easy Coast, North Carolina has a purse race at every race, points and other facts. If the business hours of Mountain Masochist 50 Mile Trail Race in may vary on holidays like Valentine’s Day, Washington’s Birthday, St. Patrick’s Day, Easter, Easter eve and Mother’s day. We display standard opening hours and price ranges in our profile site. 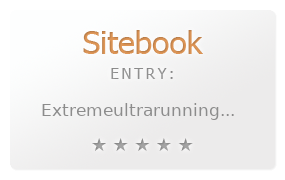 We recommend to check out extremeultrarunning.com/mmtr.htm for further information. You can also search for Alternatives for extremeultrarunning.com/mmtr.htm on our Review Site Sitebook.org All trademarks are the property of their respective owners. If we should delete this entry, please send us a short E-Mail.